You can talk to your lamppost, your park bench, your storm drain, and they all talk back to you. Bristol's Hello Lamp Post! invites you to participate in the city's secret conversation. 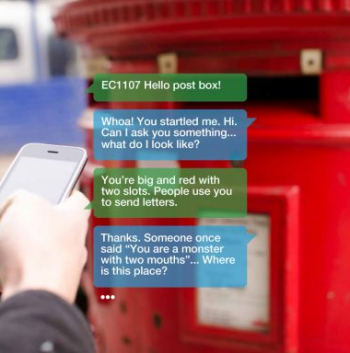 Talk to your lamp post by texting it Hello; it could say almost anything in reply, but those who participate in the city's latest game will be told Bristol's secrets. The rules are simple. Each object has a code, which the city normally uses to identify individual items, for repair and upkeep purposes. That code is posted directly on the object, be it bollard, storm drain, bench, or whatever. You send a text with Hello, plus the name of the object, and its code, to that object, and it will send a text right back to you. Maybe it will just complain about the weather - always a popular British pastime - or maybe it will say, well, whatever else is on its mind. Long term players learn secrets about Bristol, sent in texts written by the city direct to them. The game will play out during summer 2013 in this historic UK seaport first, before going on an international tour. It was put together by design studio PAN - inventors of, among other things, a zombie defense laser trap - as part of a competition in which 93 contestants took part. To the winner goes Â£30,000, to help it put the game together. "Hello Lamp Post! stood out with a potential for both art and play using existing urban furniture," says competition judge and Google Creative Director Tom Uglow. "It points to a future made up of the physical objects already around us, the 'internet of things', and the underlying complexity is made simple and easy for people by just using SMS for this project." Bristol, eh? Could be nice in the summer, and I'm told it has very friendly bus shelters.